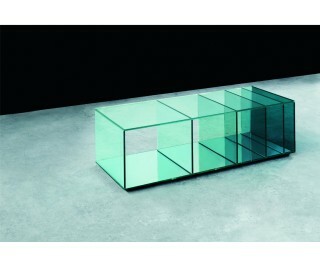 Collection of low tables and bookcase in laminated and thermo welded transparent extralight glass. The shelves of the bookcase and the vertical elements of the low tables are in coloured transparent glass available in grey or blue tone. Moving from one element to the next, the distance between them gradually decreases, whilst the intensity of colour increases. This chromatic effect, associated with the mirror bases, bestows great depth to the pieces and a play of magical reflections.